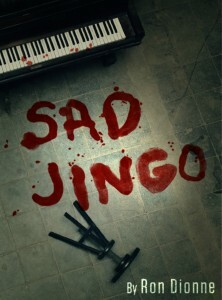 So I had accepted the offer from Delabarre Publishing to publish my novel SAD JINGO as an ebook, and had withdrawn it from consideration at Akashic Books. I had chosen the Wild West that book publishing had suddenly become, over the gentler precincts of traditional publishing. Did that mean I just handed over the manuscript to Delabarre for formatting and slapping on a “cover” and posting to Amazon, Barnes & Noble and the iBookstore an hour later? It could have. We’ve all seen it done. I, for one, often cringe at the results. One of the drawbacks of taking the bracing, inspiring plunge with an entrepreneurial new publisher operating on a shoestring budget is that you can’t pay editors with shoestrings. Delabarre had no paid editors on staff. It was up to me, if I wanted to sleep nights, to hire professional editing done. It sort of is, in a comfortable armchair way, like setting out into the frontier in search of that one quirky gunslinger that has just the right skills to catch the bad guy who’s made your life a shambles. In this case, I needed a wily master of plot, pacing, and taste to help me sort out which of the two versions of my book was better, which revisions were improvements and which were not. I needed someone to help me find the best Jingo there could be. And, as it turns out, to save me from myself. How do you find such a person? Unfortunately, you can’t put on dusty boots and a cool-looking duster and saddle up a quirky horse for a ride through gorgeous back country that would look great shot with the Libatique lens and Blanko Freedom film in the Hipstamatic app on your iPhone. No, you need to research developmental editors, freelance editors, and book doctors, most likely on the internet. You have to talk to as many people as you can, and listen hard. Some folks you like and want to agree with. Others you’re not too crazy about but you respect their opinion and you have to guard against dismissing any wisdom they might impart because, say, they voted for the other guy in the last election. You kind of have to drive blind, and trust your horse sense. I talked to folks I knew who had published. I studied web pages. I queried folks with fancy web sites. I queried folks who did not seem to be all that on-line at all, ironically enough since I was embarking on an ebook-only (for starters) adventure. And that bit about horse sense? Hey, I’m the writer who had a serviceably good book almost sold to an editor so beloved by the industry they named an award after him when he passed. I’m the writer who, despite that pinnacle of near-achievement, decided I needed to revise the thing and make major changes to it. “Update” it. Horse sense? Not my forté. But it was all I had to rely on. Eventually, I narrowed down my choices of prospective plot wranglers — I mean freelance editors, to two. I sent the book to both. I consulted the ghost of Mr. Ashmead and imagined a friendly scowl. Not really. I don’t truck with ghosts, but I thought about it. And I thought about sometimes folks needing to hear what they didn’t want to hear, that strong, evil-tasting medicine can sometimes be just what you need. The other editor had actually worked with Larry Ashmead at HarperCollins, the editor to whom my now publisher had almost sold the book in the 1990s. I found her through Publishers Marketplace, where a testimonial quote from Mr. Ashmead on her member page caught my eye. I sent her my original version, and explained I was unable to judge the merits of the revisions in my updated version. When she and I talked, it became clear right away that the book needed a comparative read of the two versions. The elephant in the room was the fact that I’d revised a finished work finished long enough ago that the writer I was then was a significantly different person that the writer I am now. How to decide? One editor said the book had merit but needed significant change. The other said the book had merit but she wanted to see how I had changed it and take the measure of those changes with the original spirit of the book in mind. The first had more novels under his belt, as displayed on his web page. The second had more nonfiction listed among her credentials, but she also had the Ashmead connection. I went with the second editor, Alice Rosengard. And I am not sorry. She read the original carefully. She took her time, spotting some things that needed fixing. Then she read the revised version, noting a few improvements but more importantly some changes that marred the original intent of the book, and detracted from the strengths that almost got it published in the first place. I am convinced she helped me make the book the best that it could be. For me, the editing of it was validation. Validation by a stranger with whom I developed a rapport based solely on the content of a piece of writing I sent her. That means a lot to me. I realize this is inside shop-talk before reality hits. Now it’s up to readers to decide if they like the book. And me to promote it. More on that later.